The other day, I was in a cab with friends and I was going on about how there's something about New York in the wintertime that makes me want a glass of red wine pretty much every night. I'm not sure if it's the cold weather, or the need to wind down from the hustle of the city - probably a combination of both. And for me, it's also probably got something to do with the fact that I'm loving the city so much right now ... sort of like I'm celebrating that each night with a glass of wine. Why not, right? Then, I get to thinking about hot winter cocktails. Naturally. This is an arena of imbibement that I've never been able to fully explore as a born-and-raised Florida girl. Red wine is wondrous - it really is - but how about concocting something that's truly designed to be drank in the winter? The first thing that pops into my mind is a hot toddy. I don't know much about it - other than the fact that the name is pretty adorable - so I look it up; when I see that bourbon, honey, and lemon are the main ingredients, I'm sold. Let's not forget about the fact that a hot toddy is a cocktail that, supposedly, one drinks when one is sick. 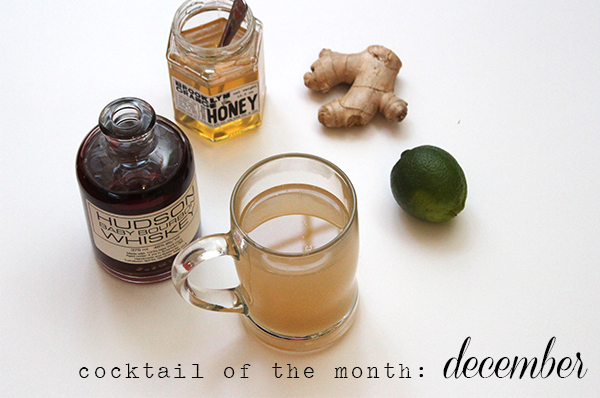 It's an old-school cold and flu remedy, which makes sense considering the honey and the lemon. I think the alcohol gets thrown into the mix to make you forget you're sick, or at the very least, make you feel a little better in the moment and maybe even put you to bed sans NyQuil. All of this I like. I love the idea of adding ginger to a hot toddy even more, and if you're really going to start tossing back bourbon when you're sick (in which case, can we be friends? ), I would think the kick from the ginger would knock out a cold twice as fast. And for those of you just looking for a way to warm those cold winter bones, the ginger does the trick there, too. Ginger, honey, and lime work so perfectly together - and when you add bourbon to the mix? Fuggedaboutit. Boil water and ginger for 15 to 20 minutes, until liquid is reduced to about 1-1/2 cups. Meanwhile, divide bourbon, lime juice, and honey among two serving mugs. Strain ginger and pour half of the liquid into each mug. Stir to combine and taste, adding more bourbon, lime juice, and/or honey if necessary. (You can also add more boiling water depending on the size of your mugs.) Enjoy!